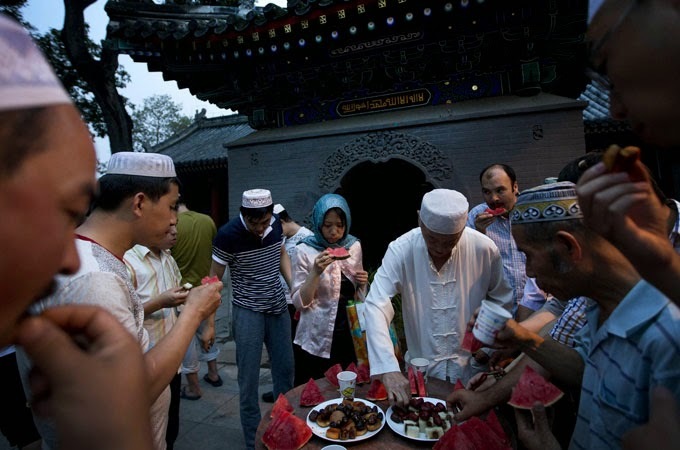 Students and civil servants in China's Muslim northwest have been ordered by the state to avoid taking part in traditional fasting during the Islamic month of Ramadan. Statements posted in the past week on websites of schools, government agencies and local party organisations in the Xinjiang region said the ban would protect students' wellbeing and prevent the use of schools and government offices to promote religion, the AP news agency reported on Thursday. Statements on the websites of local party organisations said members of the officially atheist ruling party should also avoid fasting, although the month of Ramadan, which began at sundown on June 28, is observed by Muslims. "No teacher can participate in religious activities, instill religious thoughts in students or coerce students into religious activities," said a statement on the website of the "Number 3 Grade School" in Ruoqiang County in Xinjiang. The news agency reported that cities in Xinjiang had set up news portals saying that fasting was detrimental to the physical wellbeing of young students, and also have called in retired teachers to stand guard at mosques in order to prevent students from entering. Similar bans have been imposed on fasting in the past. This year's ban was unusually sensitive because Xinjiang is under tight security following a number of attacks that the government blames on Muslim rebels who allegedly have ties with foreign armed groups. "This will lead to more conflicts if China uses coercive measures to rule and to challenge Uyghur beliefs," Dilxat Raxit told AP. Violence has escalated in recent years in Xinjiang. The ruling party blames rebels who it says wants independence, while members of the region's Uyghur ethnic group complain that discrimination and restrictions on religion, such as a ban on taking children to mosques, fuels anger at the ethnic Han Chinese majority. An attack on May 22 in the regional capital of Urumqi by four people who threw bombs in a vegetable market killed 43 people, including the attackers. On June 22, police in Kashgar in the far west said they killed 13 attackers who drove into a police building and set off explosives, injuring three officers. Authorities have blamed two other attacks at train stations in Urumqi and in China's southwest on Muslim rebels. According to AP, the ruling party is wary of religious activities which it worries might serve as a rallying point for opposition to one-party rule. Controls on worship are especially sensitive in Xinjiang and in neighbouring Tibet, where religious faith plays a large role in the local cultures.